Brilliantly cast and expertly adapted, Into the Woods is set to be embraced as the rare stage musical to receive a big screen treatment that not only retains, but enhances its integrity, heart and musical splendour. 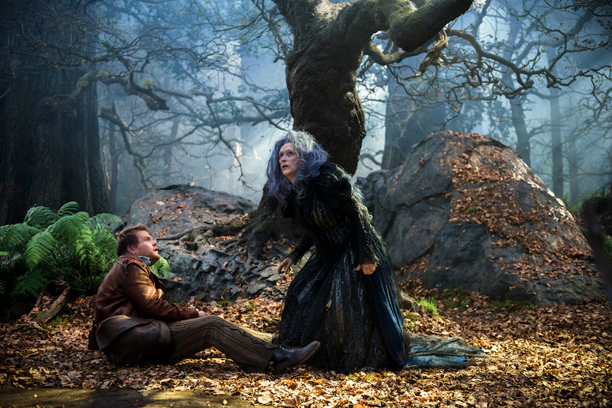 If the chief measure of success of a stage-to-screen adaptation is the experience it adds beyond that which can be achieved in a proscenium arch theatre, the movie of Into the Woods is a sure winner. Other such projects drown in the bloated excess and clumsy adaptations insisted upon by the folly of their original theatrical creators, whose egos are impervious to the realisation that their stage prowess does not necessarily translate to film. (2005’s The Producers is but one example of this). There is an irony in Disney producing the film of a musical whose main theme tune (“Into the Woods”) was written to parody and subvert their catalogue of masterworks. 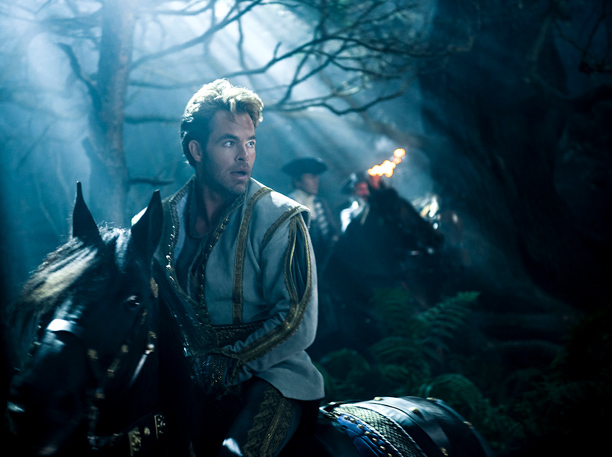 The lack of Disney-fication overall was highlighted at the preview screening when the trailer for upcoming release Cinderella showed a far more pristine set of step-relations than the skimpily dressed, genuinely nasty step-family of Into the Woods. In adapting his book of the 1987 musical, James Lapine has navigated the minefield of Disney executives, test audiences, fan expectations and budget constraints to produce a lean, focused script that preserves the dark psychological undertones and all the emotional beats of the original. The trims have been made so judiciously that it is almost impossible to begrudge the loss of a note or word. One structural change is the absence of the Narrator, as flashbacks and close ups avoid the need for this stagy device. 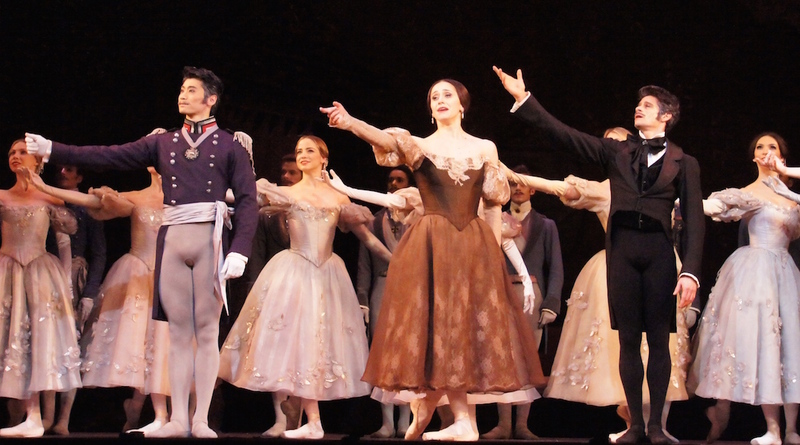 Viewers acquainted with the ending of the musical will understand the choice of character to provide the few lines of narration that are needed. 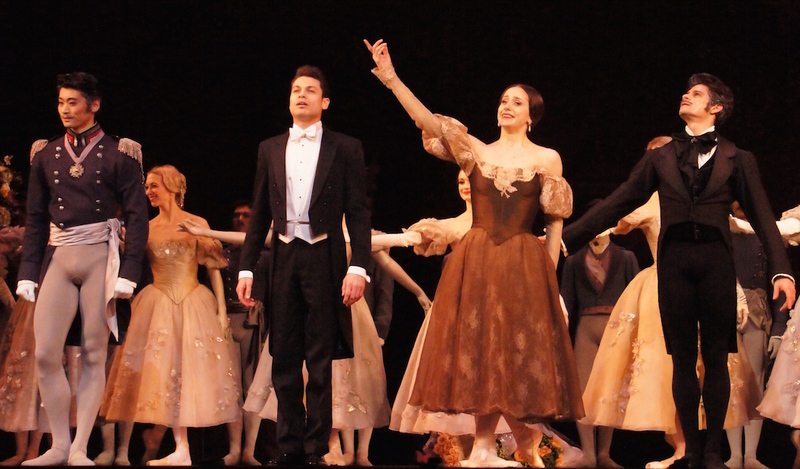 Momentum is maintained in the first half by the removal of the company “Midnight” sequences, with the second half moving even more rapidly and dramatically after a very neat, brisk and rather spectacular segue between acts. Rob Marshall, director of the gold standard of millennial musical adaptations, Chicago, is in peak form with Into the Woods. Marshall’s visual imagination takes us beyond the frame of the stage picture in countless clever ways, clearly placing the beloved fairy tale characters in an integrated, functional world. We see Cinderella on the steps of the palace, Jack climbing the beanstalk, Red Riding Hood in the wolf’s belly and the Giantess reaping her trail of destruction. Flashbacks even include a glimpse the “other story” that happened when “Bang! Crash and the lightning flashed.” Every decision of Marshall’s is perfectly considered and splendidly executed. In addressing the second aspect that can derail a musical movie, which is the inability of the original/stage stars to scale their performances back from stadium-sized to camera-ready, Marshall coaxes entirely natural, understated playing styles from the supremely talented cast. 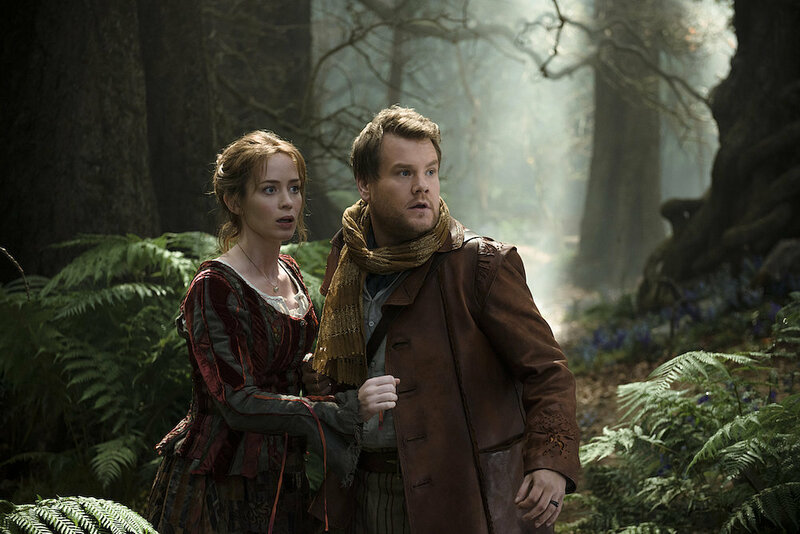 Despite the largish cast, Into the Woods is essentially an intimate chamber musical of human drama, and close ups reveal layers of motivation and greatly enhance connection to the characters. A 60-piece orchestra provides sumptuous accompaniment on a scale far beyond what could ever be heard in a theatre. Visual design is richly textured and intriguing without being distractingly flashy. If the lack of Disney interference in the story’s darker moments is one welcome surprise, another is the exceptional quality of the cast. Rather than be lumbered with the type of starlets and studs that help greenlight films (Nick Jonas in Les Misérables anyone? ), Marshall has assembled a highly experienced troupe that include distinguished stage stars, some of whom have nary a Hollywood credit. Simon Russell Beale (Baker’s Father) and Frances de la Tour (Giantess) are the most acclaimed British stage actors of their generation. 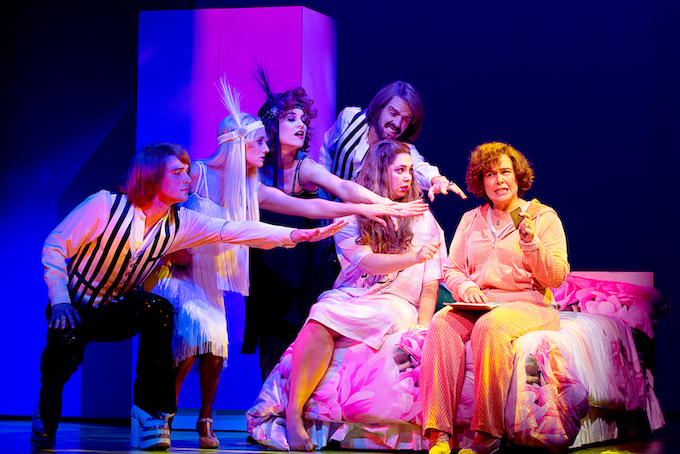 Joanna Riding (Cinderella’s Mother) is an award-winning West End music theatre star. 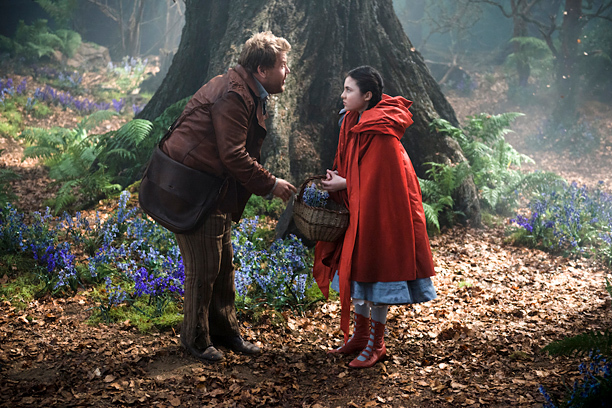 The career of young Lilla Crawford (Little Red Riding Hood) was launched in 2012 playing Annie on Broadway. James Corden (The Baker) has a Tony Award for worldwide stage smash One Man, Two Guvnors; Christine Baranski (Cinderella’s Stepmother) has two. Tammy Blanchard (Florinda) was Tony nominated in How To Succeed In Business Without Really Trying, as was Billy Magnussen (Rapunzel’s Prince) for Vanya and Sonia and Masha and Spike. 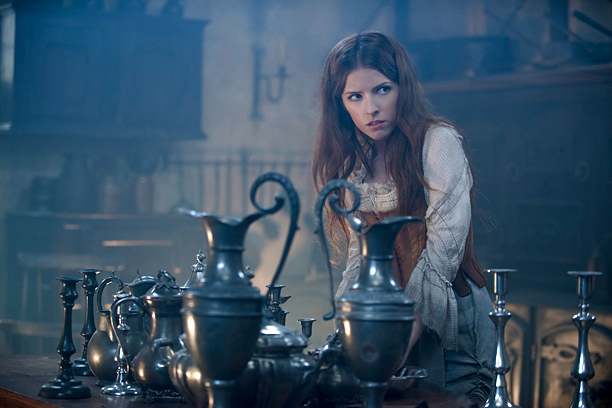 We have already heard Anna Kendrick (Cinderella) sing in Pitch Perfect, Johnny Depp (The Wolf) sing in Sweeney Todd and Meryl Streep (Witch) attempt to sing in Mamma Mia! (thankfully, her singing here is vastly improved). Breakout star of the movie is chameleon-like movie actress Emily Blunt as The Baker’s Wife. Her open, delicately expressive face speaks volumes, and her gentle underplaying of the role draws the audience towards her and earns their devoted affection. Viewers who know the plot may start to feel slightly queasy as “Moments in the Woods” begins. Larger than life stage Corden draws on his extensive television experience to dial it right down as The Baker. He and Blunt enjoy relaxed, natural chemistry and provide many delicious laughs. Kendrick, a class act as ever, captures the yearning dreams of Cinderella, contrasting this with understated bewilderment and frustration when Cinderella discovers, as many of the characters do, that achieving what you wish is not necessarily for the best. Amidst all the gentle performances, Streep comes across as the most forceful, a fact not helped by the swirl of CGI effects that accompany her entrances and exits. Still, she is tender and loving with Rapunzel, and the Witch’s horror at realising the consequence of fulfilling her wish scores a great laugh. Crawford is delightfully forthright as Little Red, playing the innocently avaricious little girl in unblinkingly straight style. A big future in all aspects of musical comedy is envisaged. 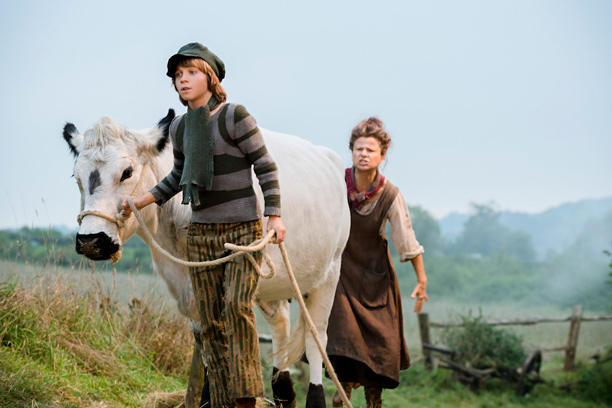 Crawford is well matched by characterful young actor Daniel Huttlestone (Gavroche, Les Misérables) as mournful soul Jack. As with the adult performers, these young stars achieve abundant empathy and humour through authentic characterisations and natural performances. Baranski practically drips scorn and derision as the wicked Stepmother. Tracey Ullman, another potentially outsized performer, effectively conveys inner doubt and irritation as Jack’s exasperated Mother, setting up a lovely contrast when the character finally has financial means in the second half. Hunky princes Chris Pine and Magnussen score a crowd-pleasing hit in “Agony” as the pair cavorts about a splashing waterfall as though they are shooting the cover of a soft-core romance novel. Only Johnny Depp is underserved by the concept for his role as The Wolf. Performing with the delectably devilish wink you would imagine, and singing perfectly well, Depp appears too human for the swallowing of Grandmother and Little Red to make much sense. 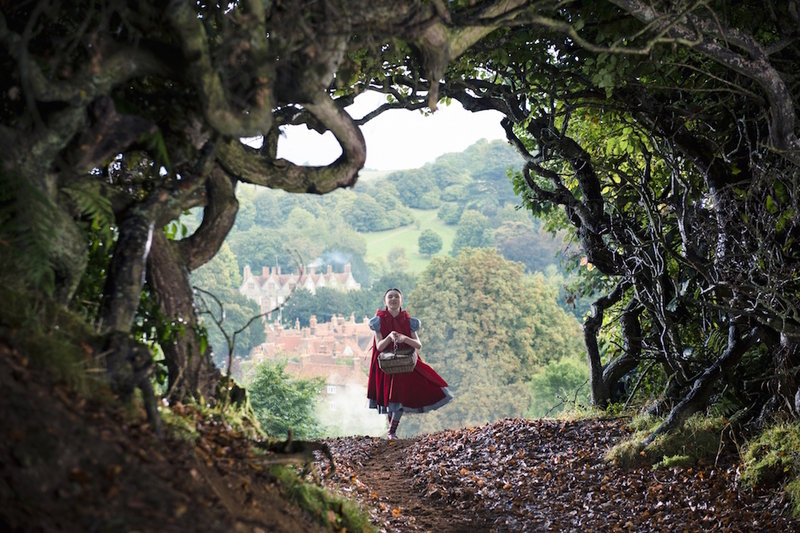 Music theatre lovers are set for an absolute treat in Into the Woods, as experience that is set to be replayed on home cinema for years to come. Whether there are enough of us in the world to make the film a hit is another question, as is the ever-present concern of whether modern audiences can cope with characters bursting into song. See you at the multiplex. 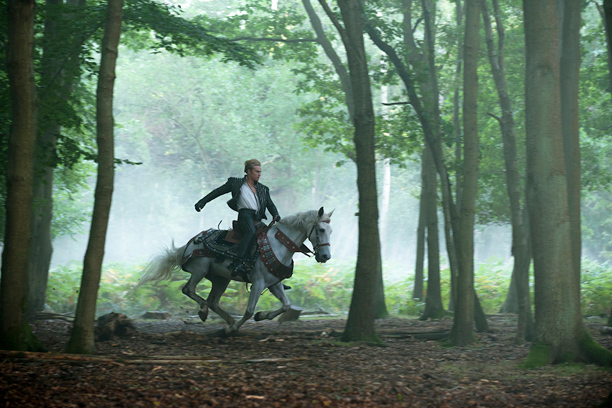 Into the Woods will be released in Australia on 8 January 2015. Can’t believe I reviewed a movie before you Mark – has the universe gone topsy-turvy?! Jealous that you saw the legendary original production. I only saw the Broadway revival. I am relieved and thrilled with the quality of the movie. That cast! Can’t guarantee it will be a hit, but fingers crossed it will go well enough.